One may think that there are three stories here that should have been made into three separate films. But, by putting them together, a unique story is concocted, where the different parts amplify each other and reinforce a cohesive whole. 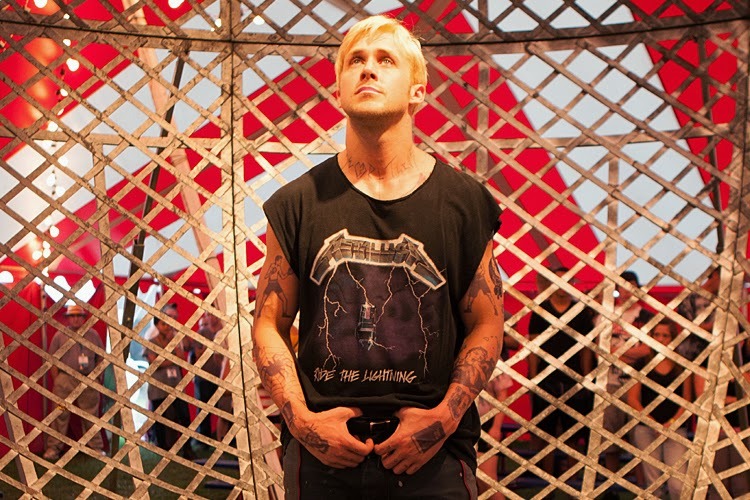 Ryan Gosling's character, Luke, (another unforgettable performance by this great actor) is a drifter who does motorcycle stunts at a traveling carnival. If you gals like tattoos, he has plenty of them. One under his eye shows a dagger dripping blood, which can also look like tear drops, implying his sad situation. He sees Eva Mendes' character after a show. We discover he had a fling with her. He implies there can't be any relationship because the show won't be back for a year. However, he finds out that she has had his baby, and she now lives at the house of her new boyfriend. Luke didn't have his father around and wants to be there for his boy. He quits the show and does some minimum wage work for a guy who was impressed by his riding in the woods. That fellow tells him he can get money for his son by using his motorcycle skills to rob banks. Luke eventually agrees, and the crime spree begins. Luke buys things for his son, and in the process, intrudes into the life of the child's mom and eventual stepdad. He assaults this man at one point, but gives himself up to the police, knowing he was in the wrong. He is bailed out by his partner-in-crime, who wants out because of Luke's increasing recklessness. Luke forces a bundle of stolen cash onto Mendes for his son. After trying to go it alone on a heist, he is cornered in a house, lets the occupants go instead of using them as hostages, calls Mendes and tells her not to tell his son about him, and is killed by a policeman. The policeman, whose last name is Cross, played by Bradley Cooper, does not wait for back-up, knocks down the door, does not repeat his police warning, and shoots Luke first. Luke gets off a shot after being fatally wounded and before falling out of a window, hitting Cross in the leg. Now the story shifts to Cross, who is questioned by his superior, played by Bruce Greenwood. During this interview, the cop's mistakes are revealed. Cross alters the story, saying he did not shoot first, and only responded out of self-defense. With the revised story, he can now be depicted by the department and the press as a hero. He does have feelings of guilt about the way Luke was killed. He tries to get his captain to make him a renovator of the department. But, his superior instead assigns him to the evidence room during his convalescence. This action is all a setup to put a supposedly beyond reproach person there so officers can steal or alter evidence. Ray Liotta's policeman and others show up at Cross' house one night and take him to Mendes' place to look for Luke's stolen money. They find it under Luke's son's crib. It is ironic that stolen cash is placed under a sleeping innocent. They give half of the cash to Cross. He brings it to his captain, wanting to expose the others. The captain wants nothing to do with the scandal that could result. Cross now mimics Luke's action, again bringing the money to Mendes, although now the money is stolen by cops. Mendes refuses it. She appears honorable in a world of criminals on both sides of the law. 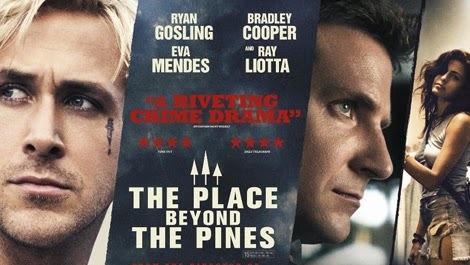 When Cross now realizes that he is in danger for trying to expose his fellow officers, he escapes a possible assassination in the woods by Liotta, and goes to his father, the judge, for counsel. His dad is a politician, and has already said that Cross is a good speaker and can use his hero status to launch a political career. Cross, who has a law degree (more irony, considering his escalating unlawful acts), is next seen extorting an assistant DA job for himself and immunity in exchange for not revealing the police corruption to the press. The story then shifts fifteen years into the future. Cross has been politically successful, and is about to be elected the attorney general of New York. But, his ambition has cost him his marriage, and his son is a spoiled, selfish drug user. The boy zones in on a youth at his new school and sees him as what he calls a "stoner loner." He pushes him into scoring drugs. They are apprehended by the police. Cross, coming to get his son, discovers that the other youth is Luke's son. Cross' son continues to pressure Luke's boy, and the latter steals drugs from a pharmacy. He also discovers who his real father was and that Cross killed him. He attacks Cross' son and brings Cross into the woods. He doesn't kill him though, and runs away. Luke rides a motorcycle, wheels that take him into a round cage at the carnival, in which he rides in circles. There are Ferris wheels and other rides in the background that go in circles. The carnival returns to the same places. Luke wants to break the vicious cycle in his family by not being an absent father, like his dad before him. But, despite good intentions, his life is locked into antisocial, self-destructive ways. The cage in which he rides is symbolic of the prison of his family lifestyle. Luke's son seems to have inherited this situation as he steals drugs on a bike, similar to his father's activity. Cross also initially tries to reform the corruption in the police department, but becomes part of the deceptive system as he has caused the death of Luke, conspired for his own advancement, and bails his son out of compromising situations through his power. Cross stands with his son on the stage at the end as victors. Despite good intentions, the darkness inside individuals and society perpetuate the sins of the fathers. Cross and Luke (names ironically having religious connotations) have good inside them, but it is not enough to overcome the negative forces around them. The end is enigmatic, since Luke's son rides away without permanently hurting anyone. But, he does so on a motorcycle, like his father. Will he follow the same path, or a different one? Why the title? The suggestion of robbing banks follows the scene where Luke rides in the woods. Liotta's character brings Cross into the woods, which causes Cross to go the political route. Luke's son takes Cross into the woods, but lets him live. Each venture into the "pines" puts characters onto a different road. Perhaps the title means that we desire to get beyond becoming lost in the woods, and reach a clearing, where we can achieve moral clarity. What do you think? Next week’s film is Prometheus.